Chicken and waffles seems to be all the rage right now, and while I have yet to have it at a restaurant, I decided it was time to make my own version at home. 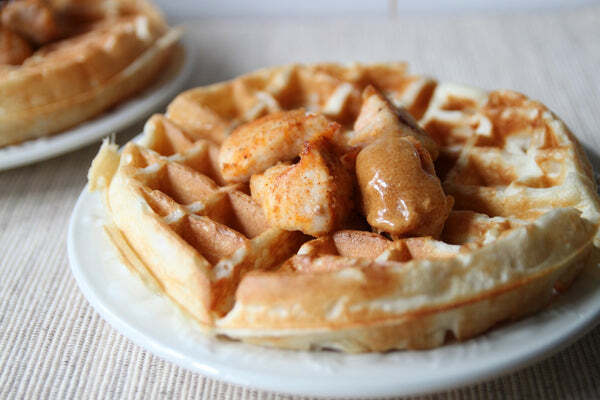 These chicken bites are breaded and baked, nestled on a golden buttermilk waffle, and drizzled with a maple peanut butter and honey glaze. Breakfast, lunch, or dinner – it doesn’t matter when you make these. Just do it! 1. 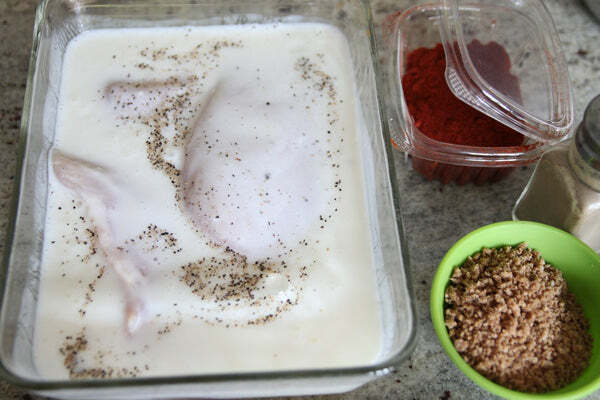 Dice the chicken into bite size pieces and toss in a dish with the buttermilk, salt, and pepper. 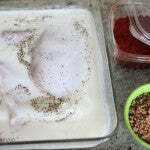 Let the chicken marinate for at least 15-20 minutes or overnight. 2. Preheat the oven to 375° F.
3. 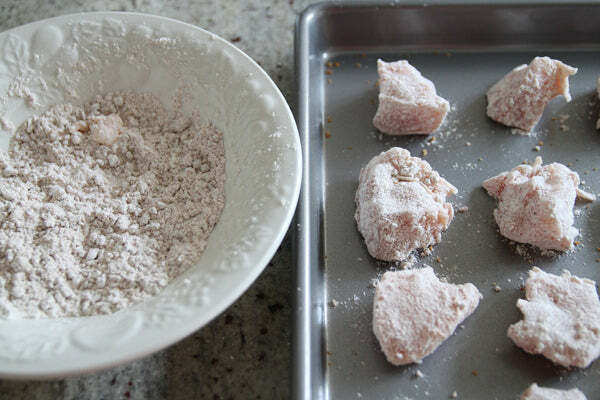 In a medium bowl, mix 1 cup flour, 1 cup panko, salt, pepper, and smoked paprika together. 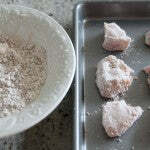 Toss each piece of chicken in the flour and panko mixture until each piece is coated. Place on a greased baking sheet and bake for 25-30 minutes, flipping halfway through, until the chicken is cooked and golden. 4. 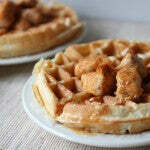 While the chicken is baking, heat your waffle iron. 5. Mix the 2 1/4 cups flour with the baking powder and sugar together in a large bowl. 6. 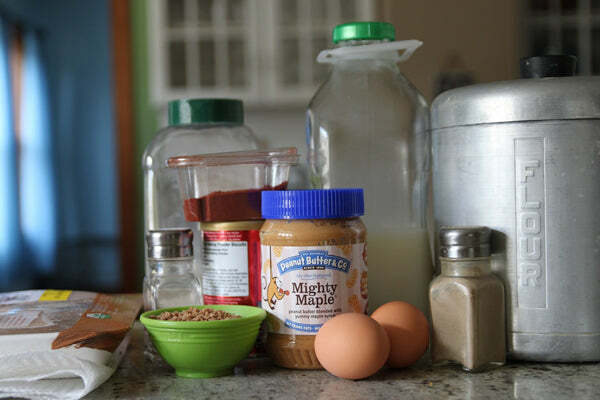 In a separate bowl, whisk the peanut butter with the eggs and the buttermilk. Pour the buttermilk mixture into the flour and stir together until the flour is incorporated. 7. 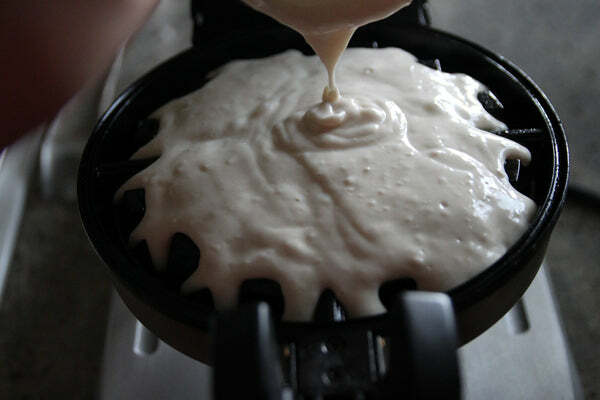 Gently fold the oil and salt into the waffle batter. 8. 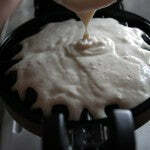 Scoop your waffle batter onto your greased hot waffle iron and cook, 4-5 minutes, until the waffle is crisp and golden. 9. 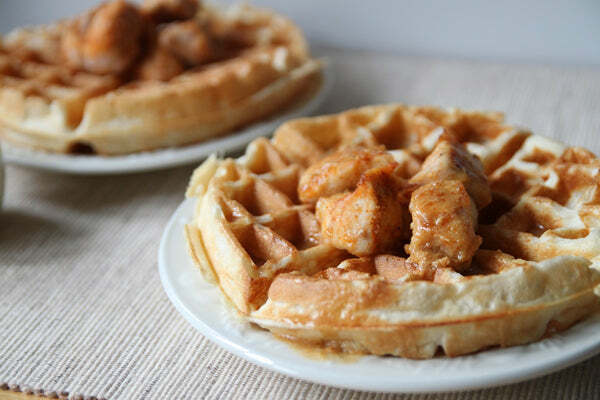 Top each waffle with a few pieces of the chicken. 10. Mix 1/4 cup of Mighty Maple peanut butter with a 1/4 cup of honey and drizzle the peanut butter/honey mixture over the chicken and waffles. What else would you drizzle Brandi’s Mighty Maple peanut butter and honey glaze on? Leave a comment below with your answer to enter for a chance at winning a jar of Mighty Maple, the peanut butter used in this recipe! – The giveaway is open to USA residents only and will run until Monday, September 24, 2012 at 11:59 PM EST. – Winner(s) will have until 9/27/12 to claim their prize or we will choose another winner. 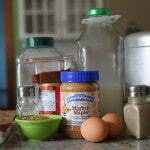 – Winner will win one 16oz jar of Mighty Maple peanut butter ($6 value). Product will be shipped by Peanut Butter & Co. 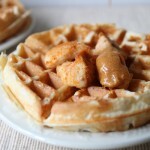 The post Chicken Bites and Peanut Butter Waffles with PB and Honey Glaze appeared first on - Peanut Butter & Co. Recipe Blog.